This recipe can be easily doubled or tripled. Preheat oven to 375F/190C. Spray a small casserole dish with non-stick spray. Trim any visible fat from chicken breasts, then put them one at a time inside a heavy plastic bag and pound with meat mallet until the chicken is as thin as you can get it. Don't worry too much about the shape or whether there are some loose pieces, you can tuck them in when you roll up the chicken. Prepare two bowls, one with the beaten egg and the other with the grated Parmesan-almond flour mixture, seasoned with black pepper to taste. 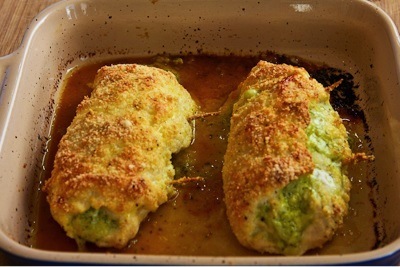 Dip each chicken breast roll first into the egg mixture and then into the Parmesan-almond flour mixture, patting it on so the chicken breast roll is well-coated with the mixture. Put chicken breasts into the casserole dish and bake until the chicken is firm and lightly browned. (Start checking after about 25-30 minutes; total baking time will be 30-35 minutes.) Serve hot.